Islamic State fighters have raised their flag over an ancient citadel in Syria’s historic city of Palmyra, pictures posted online overnight by the group’s supporters showed. The militants seized the city, also known as Tadmur, after days of fierce fighting with the Syrian army on Wednesday. “Tadmur citadel under the control of the Caliphate,” read a caption on one picture posted on social media sites. In another, a smiling fighter is shown carrying the black flag and standing on one of the citadel’s wall. It was not possible to verify the pictures’ authenticity. The ultra hardline Sunni Muslim group has declared an Islamic Caliphate over territory it controls in Iraq and Syria, carried out operations in Libya and on Friday claimed a suicide bombing in a mosque in eastern Saudi Arabia. 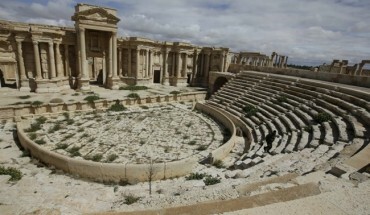 It has destroyed antiquities and ancient monuments it sees as idolatrous in other cities and there are fears it might now devastate Palmyra, home to renowned Roman-era ruins including well-preserved temples, colonnades and a theater. Supporters have also posted videos they say show the group’s fighters going room to room in government buildings in Palmyra searching for government troops and pulling down pictures of Syrian President Bashar al-Assad and his father. Some activists have said more than 200 Syrian soldiers died in the battle for the city.